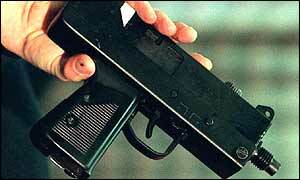 The carrying of replica guns and air weapons is to be banned under a new government crackdown. Home Secretary David Blunkett announced the plan on Wednesday, ahead of the publication of new firearms statistics. The figures are expected to show a 20% increase in gun crime in England and Wales. Home Office officials said legislation would be brought in to ban anyone carrying a replica or air weapon in a public place without a good reason. The age limit for acquiring and using an air weapon without adult supervision will also be increased from 14 to 17. The bans were flagged up in the Commons last Autumn and have been drawn up after consultation with police. A Home Office spokesman said the fine details of the legislation had yet to be worked out. But existing owners of replica weapons were likely to be able to apply for a licence or be offered an opportunity to hand in their guns voluntarily. Low-powered air weapons would not require a licence, but new powers would allow police to confiscate them if they were being carried in a public place "without good reason". The Home Office is also examining a ban on the sale, manufacture and the import of what are known as tandem air cartridge systems, such as the Brocock ME38 air pistol, which can be illegally converted to fire bullets. According to the National Criminal Intelligence Service, this weapon accounts for half of all converted firearms seized by police in London. Ministers are considering the licensing of weapons already held. A spokeswoman said arrests of people with replica firearms would be down to the discretion of individual officers. She said: "Officers would take into consideration the manner in which they have been alerted to the fact someone is carrying a firearm so they will have background knowledge. "If someone is waving a cigarette lighter shaped like a firearm at police officers then that is very different from it being used to light a cigarette in a pub. "It's about people causing difficulties for police officers and that's obviously different from a child in the street playing cowboys and Indians." Having a replica gun for use in historical re-enactments or plays will be considered a reasonable excuse. Commenting on the proposed ban, Home Secretary David Blunkett said: "We are determined to tackle gun crime. "Our guns laws are already among the tightest in the world, and these new controls will help the police to deal effectively with anyone misusing replica weapons or airguns." Mr Blunkett also plans to introduce a minimum five year sentence for carrying illegal firearms. But he has insisted the new measures are not a snap response to the New Year party shooting in Birmingham, in which two teenage girls died. The new proposals were welcomed by local MP Khalid Mahmood, who has been campaigning for tighter controls on replica weapons. He told BBC News Online: "Obviously replica guns were not used in the New Year incident. "But the moves announced today [Wednesday] start to address the culture that leads young people to think it is acceptable to carry guns." He said teenagers as young as 14 were getting their hands on replica weapons and terrorising communities. It was relatively easy - particularly in the West Midlands with its strong industrial base - to find someone to convert replicas to live firing weapons, he added. The move was also backed by Conservative shadow home secretary Oliver Letwin. But he said he did not think it was necessary to change the age limits as this was already addressed by the ban on use in public places. Official figures due out on Thursday are expected to confirm that gun crime in England and Wales rose by 20% in a year. About 9,000 incidents involving firearms are believed to have taken place in year to April 2002 - up from 7,362 in the previous year. That excludes incidents involving airguns. The figures break down to 22 firearm offences a day. In 1997, when Labour first took power, there were 4,903 firearms incidents. "The new changes will make our gun laws stricter than ever"
"There will be a ban on carrying replica weapons in public without good reason"
How can guns be made less accessible?